As the "smart" central control device, Energy Kinetics' Digital Energy Manager provides continuous system monitoring and simple diagnostics for a virtually maintenance-free, combined heat and hot water system. Five, ten, twelve, and fifteen zone control models allow for multi-zone thermostat settings-resulting in added comfort and overall energy savings for homeowners and business owners. This control is so smart it’s simple, and on board diagnostics and tools make understanding operation and service easy. Installation is simple: The factory pre-wired harness and quick reference notes on settings save valuable installation and system set up time. The installer simply brings in power, and connects thermostat and zone valve wires. That’s it. Thermostat LEDs – display areas of the home calling for heat. Individual Zone LEDs – display areas of the home being heated. Temperature Indicator LEDs – display boiler return temperature. Monitor Output Connection – signals lack of fuel or burner operation, inadequate water flow, temperature sensor error and potential freeze conditions. May be connected to home or building security system, signal lights or devices and dial out systems. Customized Option Switches – Allow for hot water priority settings, chimneyless operating functions, customized zone energy recovery settings, and more. Option switches customize the digital energy manager for each home installation. Installers can enable hot water priority, set operating and minimum temperature levels, power vent purge time and individual zone energy recovery control to best suit each home’s needs. And all Energy Kinetics’ oil fired heating systems are fuel neutral, so they operate with natural gas, oil heat, or propane (only a simple burner change is required to change between gas and oil fuels). Accel CS™ can be operated with either natural gas or propane with a simple orifice change. The Digital Energy Manager is responsive to cold returns from large or small water volume systems, and always maintains safe minimum boiler temperatures. Unlike temperature reset controls, the Digital Energy Manager with Hybrid Energy Recovery® is not dependent upon complicated trail and error adjustments to operate at peak performance. Energy Kinetics’ Hybrid Energy Recovery also outperformed temperature reset operation and modulating condensing boiler technology in the Department of Energy’s Brookhaven National Laboratories testing. Every System 2000, 90+ Resolute™, and Accel CS™ come with clean internal wiring, instructions and clearly marked terminals. The Digital Energy Manager uses readily available plug-in relays, has separate on/off switches for system power and burner, and even more to complete a very service friendly package. The Digital Energy Manager is as a very powerful diagnostic tool that can test all manager functions in less than 2 minutes. It also provides useful information with indicator lights, thermostat connections, outputs (zone connections). The manager cannot cause a burner lockout. Power sharing Wi-Fi thermostats like Nest may cause false signals if not wired properly. Click Here to download Nest and other Wi-Fi thermostat wiring instructions. Honeywell and other Wi-Fi thermostats typically require a C-wire, which is connected to A2. Ecobee requires a C-wire unless air conditioning is connected and the power extending kit (PEK) is used. For all thermostats, R is connected to A1 and W is connected to T1 (for zone 1, or T2, T3, etc. for other zones) – see Nest and Other Power Sharing thermostats wiring diagrams. Note: The Nest thermostat is compatible with Display Energy Managers, the Accel CS, and the Ascent Combi without a C-wire. The Manager Service Board works with the Display Energy Manager, the Digital Energy Manager, and the Classic Manager. The instructions are printed right on the front of the board. This ingenious tool allows System 2000 and 90+ Resolute to run in “conventional boiler mode,” so the burner, zones, circulator and entire system operate just like a common “maintain temperature” boiler (including lower efficiency operation without Energy Recovery). Troubleshooting is easy for any heating professional with boiler and burner experience, and there’s no need to know anything about the manager controls to work on the system. The service board also allows the boiler to run if the manager is damaged or is not functioning properly. Be assured that the manager is very durable and virtually maintenance free-if you ever suspect there is a problem, heating professionals should review the diagnostic video and contact Energy Kinetics if a problem is identified. You and your customers can have peace of mind because the Display Energy Manager comes with a five year part warranty which includes a lifetime protection – no product registration is required! 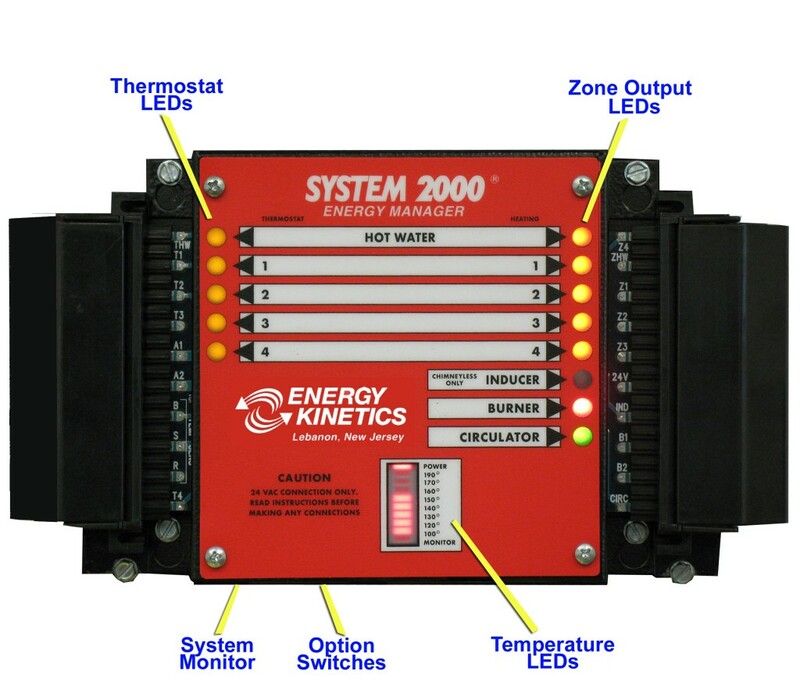 As the “smart” central control device, Energy Kinetics’ Display Energy Manager provides continuous system monitoring and simple diagnostics for a virtually maintenance-free, combined heat and hot water system. The display provides additional system information and diagnostics. The Classic System Manager was the precursor to the Digital Energy Manager, and monitors the need for heat, both in living areas and in the hot water storage tank. The basic diagnostics are very similar to the Digital Energy Manager, so viewing the Digital Energy Manager page may also be helpful.